The ETSI General Assembly has re-elected Luis Jorge Romero as the new Director General for the European standardisation organisation in Sophia Antipolis, France, on Tuesday. 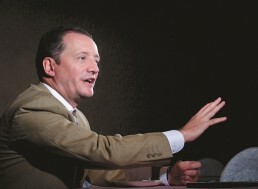 Luis Jorge has held the position since 2011 and the mandate is set of another five years. The role of Director General is to head the Secretariat of ETSI providing technical, administrative and logistical support for all the organisation’s activities. In the coming years, ETSI will face the challenge of overseeing the standardisation efforts underpinning the fourth industrial revolution, especially the increasing importance of the Internet of Things with the upcoming 5G networks while ensuring a high level of trust and security against cyber threats. Bringing together various stakeholders in the form of the European Commission, national governments, large corporations and SMEs will be main task for the new Director General. European DIGITAL SME Alliance congratulates the Director General on his re-election and is confident he will continue to promote inclusiveness as a guiding principle of ETSI’s work. Recognising the importance of European small and medium-sized businesses for establishing and maintaining a competitive European economy supported by globally influential European standardisation is essential for success in an increasingly digital future.